In this column, I share stories from the Isles of Shoals and beyond. 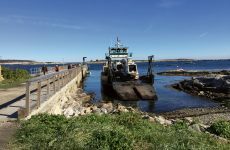 Some six miles south-southeast of the mouth of the Piscataqua River, this amazing place is host to a variety of interesting vessels, wildlife and people – a rest stop on the East Coast maritime highway. A second major coastal storm in less than two months scoured the Isles of Shoals over an extended period on the second and third days of March. As in the January storm, astronomical high tides coincided with high winds gusting over 50 knots to create a storm surge rivaling any seen since 1921 when recordkeeping of such phenomena began. This storm was light on rain and snow, but it lingered offshore much longer than its predecessor, allowing waves to build to 25 feet and more. Through the course of the event, reports trickled ashore from the caretakers. Having spent years at sea before their 21 winters at the Shoals, they have seen it all when it comes to wind and wave, and are not easily impressed by run-of-the-mill weather. On Friday night, March 2, came the cryptic report, “all humans are weathering the storm well.” Reading between the lines, I sensed concern for the island’s other winter residents (Canada geese and snowy owls) and a pass on what physical damage to structures might be discovered in the light of day, as the second 15-foot tide loomed at midnight, and the high winds continued unabated. Early Saturday morning the webcam from nearby Appledore Island broadcast shaky gray images showing trains of huge waves cascading over and through the breakwater into a turbulent Gosport Harbor covered in sea foam. The caretakers’ update around Saturday’s high tide was uncharacteristically animated: “Waves are spectacular. That tank below the trestle is wiped out completely.” Accompanying video showed white water spewing up the cliffs and over acres of the high ground on the island’s southeast shore. Breakers could be seen reaching to the top of the lighthouse tower a mile away on White Island. In the harbor, the tide had risen as close to the top of the pier as I’ve seen in my time at the island. The remarkable scene was a stark contrast to the inviting shelter of the placid and sunny summer harbor which is the experience of most visitors, and it brought to mind the dangers which the early inhabitants of the islands surely faced, when scores of schooners worked the surrounding waters without the benefit of weather forecasts, a sheltered harbor, a stout granite pier, or modern materials for mooring and securing vessels. From the 16th century (and perhaps even earlier) European fishermen were drawn to the Isles of Shoals for the abundance of codfish that were said to run in great schools (or “shoals” in the old English). The fish were often said to be as tall as the fishermen who chased them. In colonial times the islands were home to hundreds of souls and their many boats, worked by oar and sail from the slick ledges of the shore of a harbor with notoriously poor holding ground, and open to wind and wave from both east and west. It was well into the 19th century before breakwater construction would provide significant protection from winds from the east. The harbor is still famously exposed to northwest gales that can scale up in any season with a passing cold front. The demise of boats and men in those earliest days is mostly lost to history, but both were surely significant and must have been sadly frequent. In my own time at the islands I have witnessed a few catastrophic losses and even more very close calls. 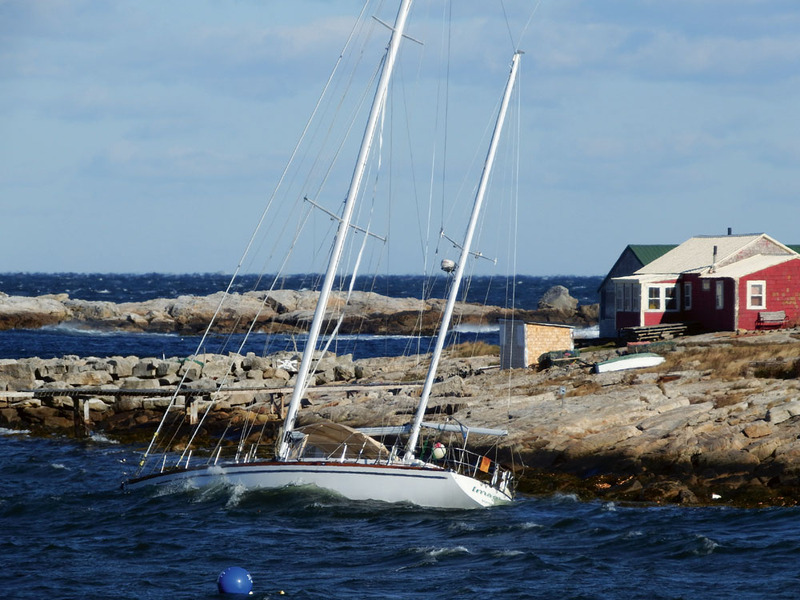 Just this past November a 65-foot ketch went ashore on Cedar Island resulting in a total loss. 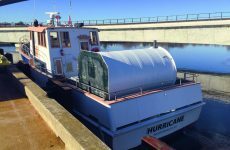 After weathering an October gale with winds over 70 knots, her moorings finally gave way as a routine late fall cold front whipped the harbor into a tight five-foot chop with gusts over 40. She remained there for weeks before salvage crews found a suitable weather window to allow her removal. I last saw her sad remains ignominiously layered into two dumpsters at the boat yard in Eliot. While the legendary hurricanes and nor’easters get the headlines, in many ways the northwesterly gales are the most dangerous. They roll in with little fanfare and can build rapidly. The waves grow without interruption across the seven-mile fetch from the mainland. They steepen abruptly in the harbor shallows just before slamming against the unyielding cul-de-sac of the back cove ringed by Cedar Island and the breakwaters. A boat that comes free in those conditions can be lost in minutes. I remember a Columbus weekend cruise in 2001 when such a front turned a balmy Sunday evening into a shockingly cold Monday morning, with snow showers and rapidly rising winds from the northwest. Secure on a mooring in the lee of Star Island, the extent of the deteriorating harbor was not evident as my young crew of three and I enjoyed a pancake breakfast in the cozy saloon. But heading out of the cove and directly into the full breeze, the underpowered Aloft nearly refused to round up. By the time we were even with the end of the Star Island pier, our headway was reduced to a crawl in the gusts that continued to build. Clawing ahead toward a big mooring, with the bow rising and falling wildly, I sent my intrepid 15-year-old son forward with a boathook and a command to make sure he caught the pendant the first time – because there would not be a second chance. Freshly returned from a sailing course at Outward Bound, he was up to the challenge, and we spent the next few hours in the roller coaster of a cabin until the wind died down enough to head back in. Had he missed, I’m quite sure we would have ended up like November’s ketch. Even in June, the cold fronts can render the harbor untenable and the moorings unreliable. In 2014, a clearly inexperienced couple’s island getaway in a 56-foot Sea Ray took an unexpected turn when the wind went into the west and built to over 30 knots. The big boat quickly overcame the undersized mooring, turning broadside to the wind and fetching up sharply on a rocky finger of Star Island just in front of the pier. From the pitching floats it seemed at first as though nothing could be done as the waves slammed the unfortunate vessel in the shallows against the craggy shore. But the hull was still intact, and after considering the safety of the couple aboard, as well as the impacts of the oil spill and the wreckage that would be left when the boat finally broke up, we pulled a volunteer crew together with a plan to get her off before it was too late. After discussing the options, we mobilized an inflatable with two lifeguards aboard, and the 28-foot Wayne Beal lobster boat we called “Miss Julie.” Repeated efforts by the inflatable crew failed to get a towline to the Sea Ray, so the two of us on Miss Julie backed down close enough so that the stunned and overwhelmed vacationers could finally get a line on their bow. As the Coast Guard and the Marine Patrol stood by, the little boat dug in and finally pulled the big yacht off the rocks and out into deeper water where she was ultimately taken under tow by a salvage firm. The Coast Guard recognized the Star Island crew with a seamanship award for saving the vessel from total loss and averting an environmental disaster. The whole episode can still be seen on YouTube, if you search for “boat rescue off Star Island.” It is still amazing to me to see the rescued couple sitting idly in deck chairs as they were towed to safety. As we plan for the upcoming season, whether we go to sea for work or play, these stories serve to remind us how quickly things can go wrong. The price of safety out there is preparedness and constant vigilance, sometimes, but not always, enhanced by a good helping of luck. 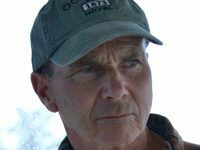 Jack Farrell is a USCG 100-ton master and the facilities director at Star Island at the Isles of Shoals, where Aloft, his Ted Hood-designed wooden sloop, lives most of the summer. Formerly island manager, Jack now focuses on running freight boats and tours during the summer season and managing the waterfront.